Increasing regulation emphasises the need for a more rigorous inspection regime. As one of our recent clients explained "I know that everything is inspected properly and on schedule, but when the external auditors arrived, there was no way to prove that this had been done..."
These systems automate the inspection process. Tags are placed at the required locations, and all equipment is also tagged. The inspector reads the tags, and an electronic record is created. Reports can show that a specific inspector visited a specific location, and confirmed the presence of specific equipment, and that this was done "at six minutes past ten on Tuesday morning." The reports generated provide an audit trail for external review. Hard copies of the reports can be printed, signed and dated, if required by local ordinance. Why is this better than the old system...? Traditionally inspections have been carried out with paper and clipboard, and the inspector signs a paper tag on each item as it is inspected. This is good. But this inspection record is left with the item. If an item was missed, all items need to be checked, to discover the error. The use of a handheld computer to collect data as an inspection is done, means that a final report will list all items inspected and show any items missed or missing. And the overhead is low. It takes a second to read the tag identifying the location, and another to read the tag on the item. Job done. How to identify the equipment. The best way to identify equipments today is by the use of asset identification tags bearing a unique identifier in barcode format. These tags are inexpensive, easy to read, easy to apply, and will not be damaged with normal wear and tear. They are waterproof, and will not be damaged from exposure to the elements. Although standard one dimensional tags are most commonly used, 2D, or stacked barcodes can be used. These have the benefit of a smaller footprint, and greater resistance to damage (they can still be read if part of the barcode is missing). And the wider availability of 2D readers make this a more effective option. RFID for Safety Equipment Inspections? RFID is a new technology, which combines great promise with some severe limitations. See RFID Myths for more detail. One of the key issues is the effect of metal on the readability of RFID tags, which can be a particular problem for Fire Extinguishers with their metal bodies. But there are some specific benefits of RFID in this application, and we are currently evaluating techniques that enable the use of RFID tags. This will give inspectors more information, and easier reading, particularly where there are multiple equipments in one location. Know the status of your fire equipment maintenance checks, know when routine inspections were done, and, more important, know when they are next due! And you can relax and smile when the auditor comes to visit. FiESTA allows you to track all forms of fire and safety equipment using BARCODES and handheld computers. An association is made between a BARCODE label secured to a piece of equipment, and to another at its designated location. A schedule of preventative maintenance and routine inspections are also assigned to the equipment. When an inspection is conducted, you are alerted if equipment is missing, or has been moved to a different location. The system provides benefits to the inspectors, to the managers, and to those protected by the equipment. 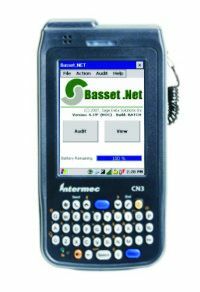 For the inspector, a handheld computer provides an ordered listing of equipment due for inspection, with the location of each piece identified. At the equipment, the inspector scans barcoded labels that identify the location code and the equipment. This confirms that the correct equipment is at each location. The handheld computer then provides the inspector with a step by step inspection routine for that specific equipment. As each point is verified, the handheld computer records the completion of that check. 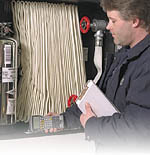 When that equipment inspection is completed, the handheld computer identifies the location of the next item to be inspected. At the end of the inspection tour, information is moved from the handheld computer to the central server, and the application permits many hundreds of different reports to be generated from that raw data. For the management team, the powerful application permits systems to be set up quickly and easily, and enables inspection procedures to be defined for each type of equipment. The system accurately records all the actions of the inspectors, tracking each inspection to the minute. And for those protected by the equipment, there is peace of mind, knowing that the safety equipment is being properly maintained.